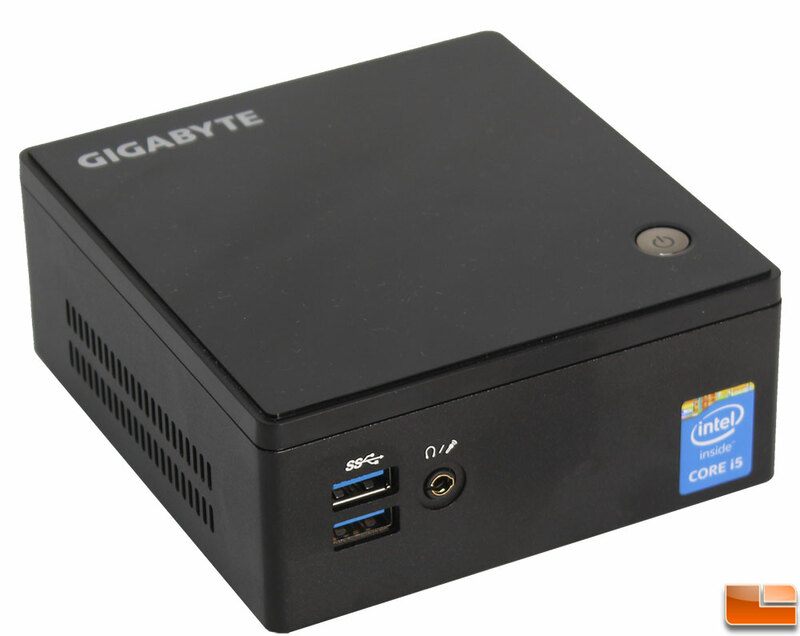 The Gigabyte BRIX s follows the standards developed by Intel with the NUC, keeping it small, efficient and powerful for a tiny system. 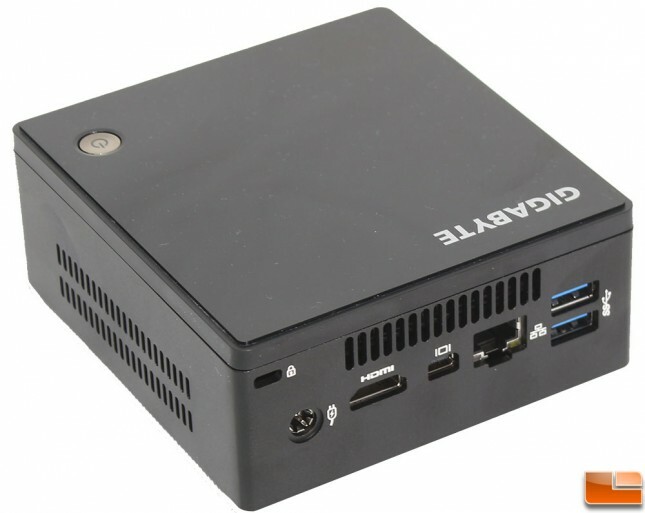 Externally, the BRIX measures 1.3in x 4.24in x 4.5in where the latest Intel NUC (NUC5i5RYH) measures 1.9in x 4.37in x 4.5in; so the Gigabyte BRIX s is slightly smaller. 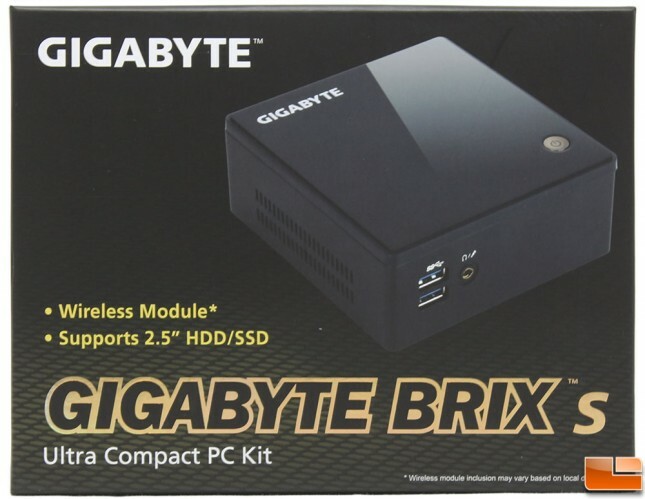 If you are unfamiliar with the Gigabyte BRIX s, the front of the box won’t tell you too much about it. 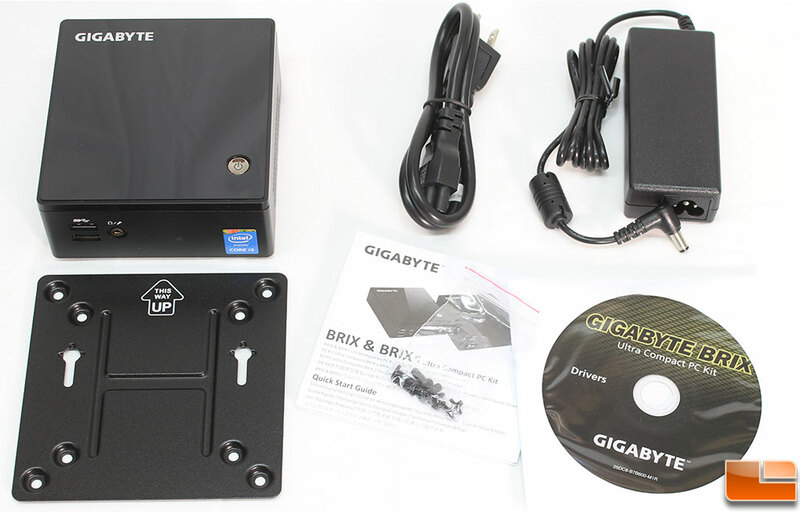 It features a small overview picture of the top of the BRIX s and two of the features. Not a big deal as most of us will probably be ordering this online rather than finding it in a retail setting. While the front of the box doesn’t tell you much about the BRIX s kit, the back of the box gives you a good idea of what the compact PC kit offers, by pointing out the various I/O ports on the front and back of the case, VESA compatibility and the internal expansion options. 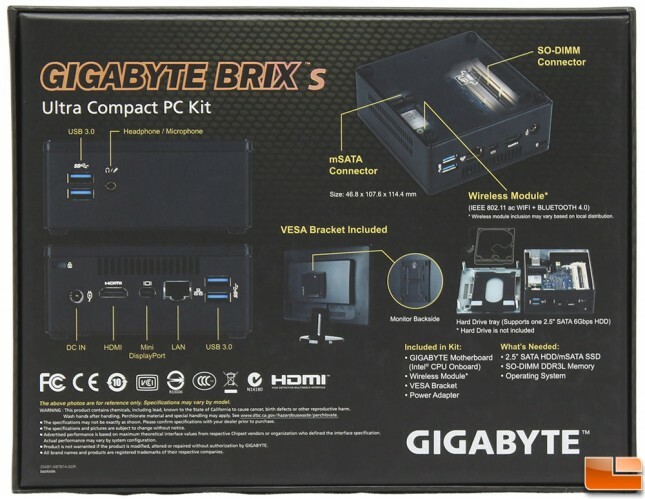 In addition to the BRIX s, Gigabyte has included an accessory pack that includes an AC power adapter, VESA mounting plate, instructions, screws and a driver disc. Overall the chassis is made out of aluminum, that has been painted black, while the top of cover is plastic. The front of the BRIX s includes two SuperSpeed USB 3.0 ports, and a single headphone/microphone jack. Along both sides, are air vents to help keep the unit cool. As I said, the top of the BRIX is plastic, and has a mirror finish on it. 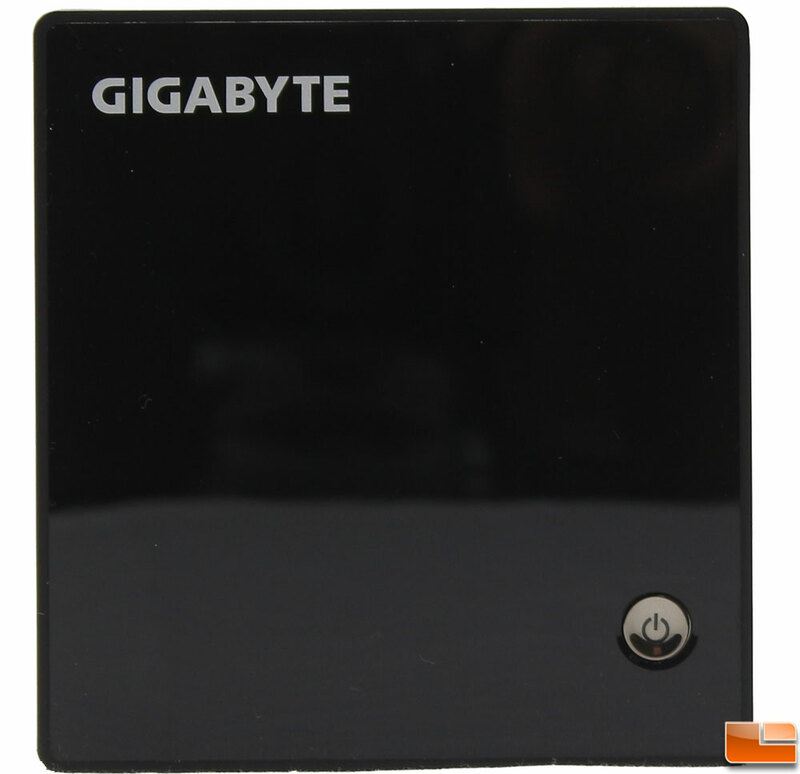 Gigabyte has placed their name in one of the corners, with the power/activity button in the opposite corner. Turning our attention to the back I/O panel, we find a Kensington cable lock to help prevent it from being stolen, the DC power plug, HDMI, Mini DisplayPort, Gigabit Ethernet, and two more SuperSpeed USB 3.0 ports. Above the rear I/O ports is another exhaust port to help remove hot air from the inside. Nothing too exciting on the bottom panel, a large label that indicated the serial number, other identification numbers and it’s certifications. There are four Philips screws located inside the rubber feet that can be removed to access the internal components. As the Gigabyte BRIX s is a barebones DIY kit, you have to add a few components to get it up and running. 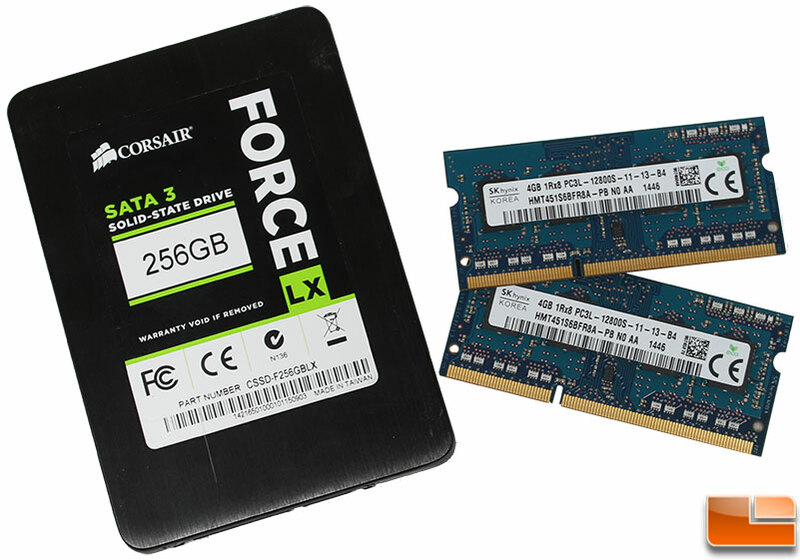 First you’ll want some storage, this can be in the form of a 2.5″ drive or mSATA; we opted to install a Corsair Force LX 256GB SSD. 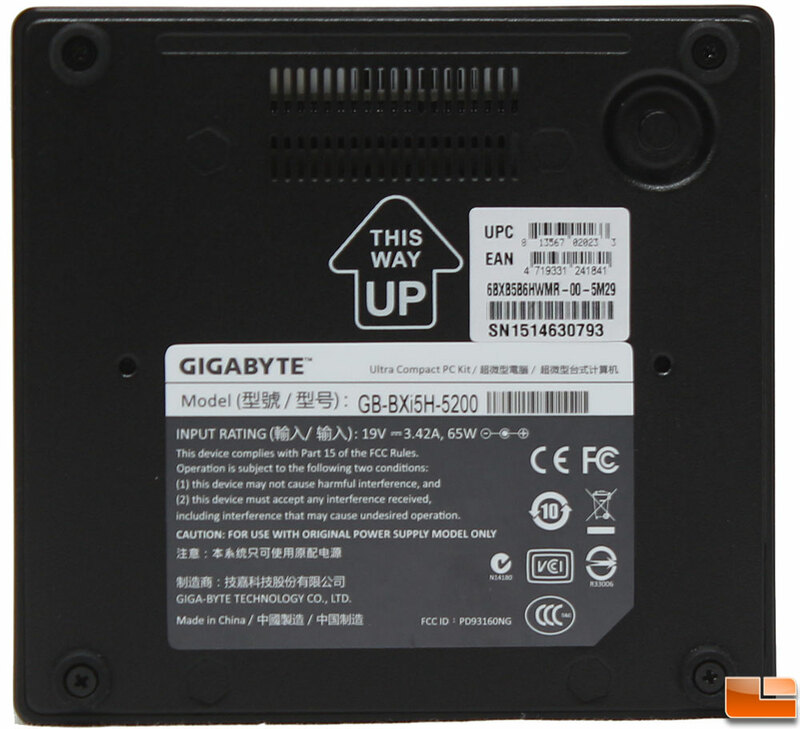 Then you’ll have to install some DDR3L memory, the BRIX supports up to 16GB of either 1333MHz or 1600MHz DDR3L memory, or if you overclock the memory, up to 1866MHz. Let’s take a look inside the BRIX before we get to finishing the build and installing the operating system.